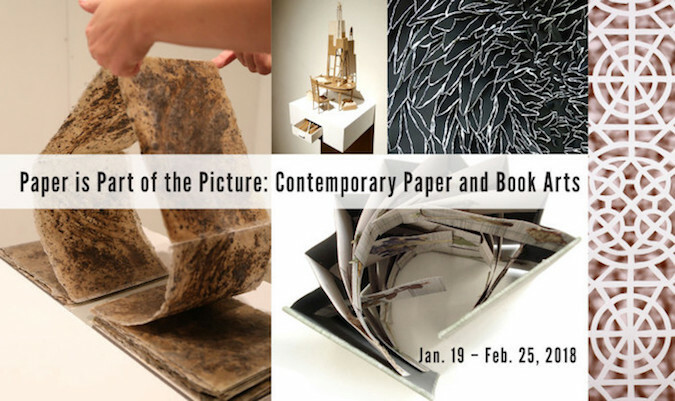 Lisa Miles (MFA 2017) and Tatiana Ginsberg (UICB Graduate Certificate and former Adjunct Instructor) are featured this month among 31 book and paper artists from around the country at Drake University’s Paper is Part of the Picture show on contemporary paper and book arts. Juried by Sarah McCoy and Mary Jones, the show seeks to explore the different substrates, approaches, materialities, and meanings revealed through their interactions on and with paper. Paper is Part of the Picture will be on display at Drake University’s Anderson Gallery in DesMoines, IA from January 19 through February 25, 2018. The opening reception will be held on February 2, 2018. For more information, check out the Anderson Gallery's website.